No goaltender in AHL history saw more action between the pipes than Marcel Paille, who appeared in 765 games for six clubs between 1956 and 1974. He was inducted into the AHL Hall of Fame in 2010. With his NHL rights owned by the New York Rangers, Paille suited up for the Reds in 1957-58. 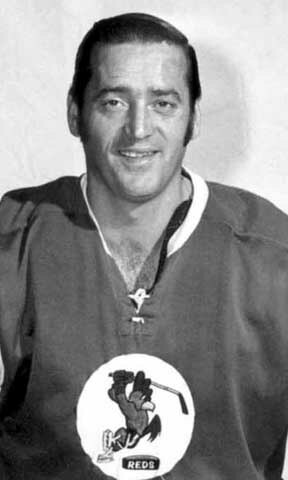 He returned to Providence in 1965 and spent seven more seasons with the Reds, returning to the Calder Cup Finals in 1971. Paille made his AHL debut in 1956-57, backstopping the Cleveland Barons to a Calder Cup championship. In 1959, he joined the Springfield Indians, who won the Calder Cup each year during Paille’s three seasons there. His 47 wins in 1960-61 were an AHL record at the time, and he won the Harry “Hap” Holmes Award in 1961 and 1962 for the league best goals-against average. Marcel’s 349 wins ranks him second in AHL history. He also recorded 36 shutouts and earned five AHL All-Star Team berths. He holds the AHL records for games played by a goaltender in both the regular season and the playoffs, logging more than 50,000 minutes in an AHL crease. His shutout streak of more than 207 minutes during the 1962 playoffs also remains a league postseason record, as do his playoff records for most games (87) and wins (49). Marcel was also inducted into the Springfield Hockey Hall of Fame in 1997.